Radio show teaser. CLICK TO ENLARGE. It was an honor to be invited to be a guest at DWDD’s radio program, Blogger’s Hour, which, for the past three years, have been in the airwaves promoting and talking about blogging and bloggers. Now with a better format when my friend Raffy Pekson stepped in last year. It was also Raffy who invited and scheduled me for the show last 20 February. This is also my second radio guesting, the first with DZAR. It was almost 1100H when I reached the radio station at Camp Aguinaldo, along a circuitous route from Makati to the camp’s Gate 6 and to the station building itself. While I was having butterflies in my stomach before the program started, it was actually easy, more of a conversation about my beginnings as a blogger, about my previous work and how I became a travel blogger. We also discussed about what it is to be a REAL travel blogger. That word, REAL, at first worried me as others might misinterpret it but Raffy explained that it was more about what REALLY goes on behind the scenes of being a travel blogger. And of course, we also talked about tips on how to become a travel blogger as well as if it is profitable. Find out more by listening to the recorded podcast. Conversation is in English and Filipino. 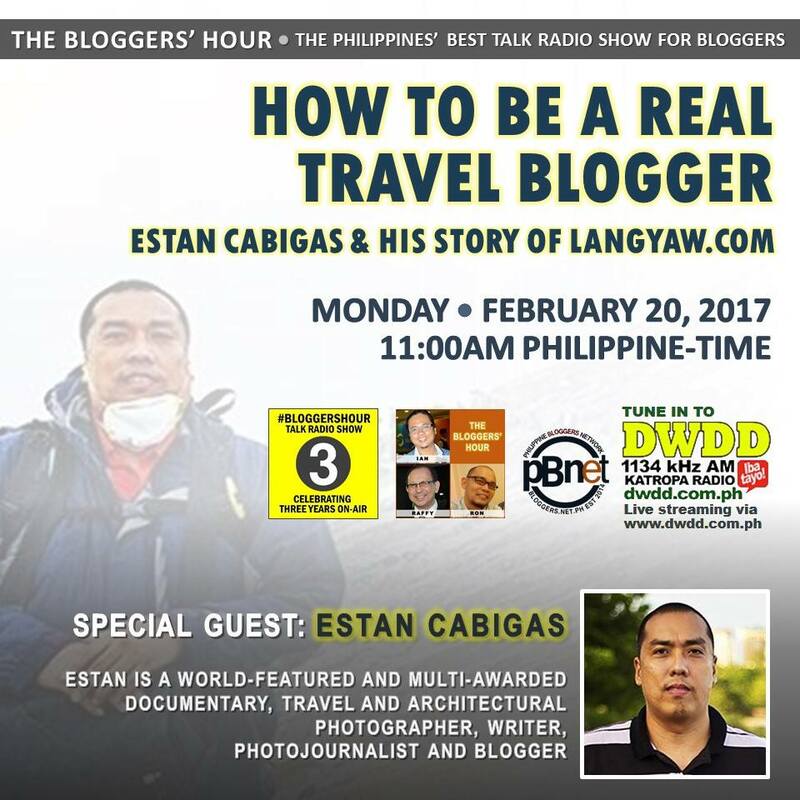 Blogger’s Hour airs every 1100H-1200H, Mondays at DWDD 1134 kHz and is anchored by bloggers Ian Bacungan, Raffy Pekson and Ron Villagonzalo. Check out its Facebook page.